Long recognised as the most reliable and effective system in the UK, P4’s industry leading Fastel emergency lighting monitoring and control system includes exciting new features for 2017. 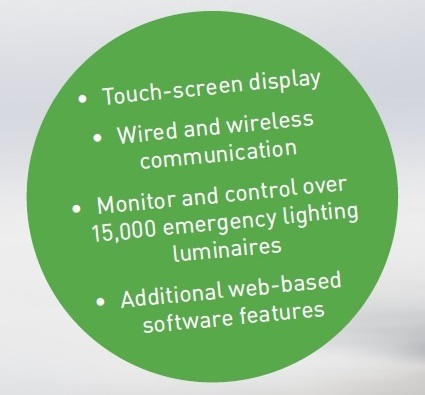 • New Fastel FWS supports full integration of wired and wireless communication to emergency luminaires and signs. 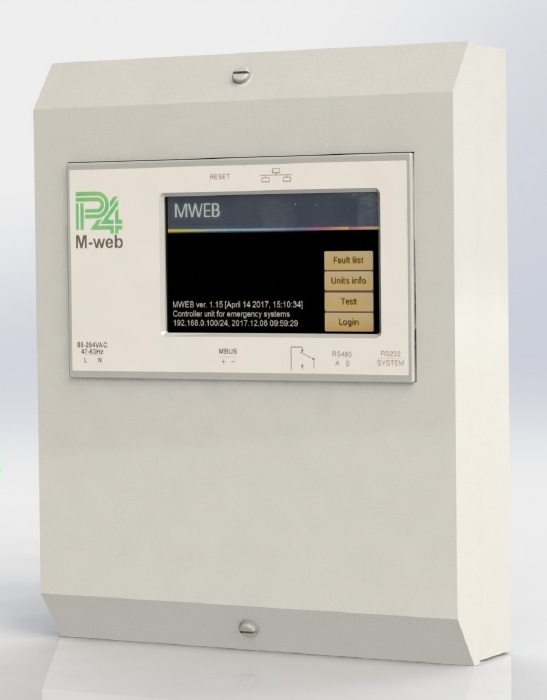 • New M-web FWSD unit includes a touch screen display for local management of the system. • Up to 250 luminaires and signs can now be directly connected to the new M-web FWSD unit. • Fastel wireless connection to luminaires and signs use mesh networks to ensure secure communications. • Wireless transmission between buildings and areas avoids expensive cable runs. • Wired connection to luminaires and signs can be used where wireless signal transmission is difficult. • System output can be displayed as HTML pages on a web browser via any LAN using TCP-IP protocol. • Data can be sent directly to BMS and data processing systems via GSM link to cloud servers for remote monitoring. Fastel FWS is an exciting development that enables fully addressable self testing emergency lighting to be installed in all types of premises without the need for bus wiring between luminaires. 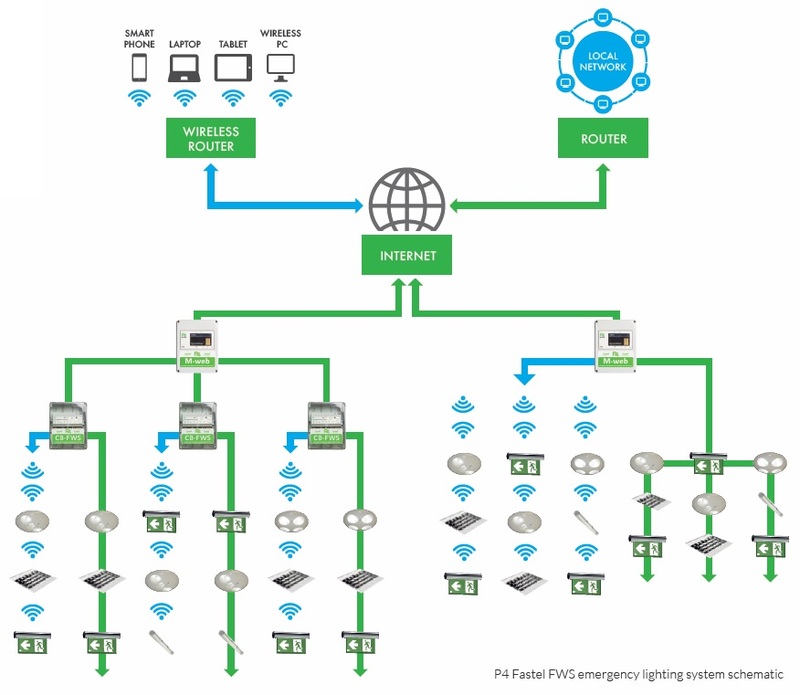 P4’s Fastel FWS addressable emergency lighting systems can connect the full range of fastel interior and exterior self testing luminaires and signs or fastel conversions of mains lighting luminaires from any manufacturer, into a network using a combination of 2 core bus wiring and a mesh wireless network. Fastel FWS is an ideal solution for premises and areas in which it is difficult to install additional wiring such as heritage buildings, buildings that are continuously occupied or in which access is difficult. Also in buildings or areas with solid ceilings and in buildings or areas that are remote from one another. It may be more cost effective to install a Fastel Wireless solution rather than adding communications wiring to existing installations. The replacement of key switch emergency lighting installations with a Fastel Wireless system can often be proved cost effective with a payback of the investment achieved typically within 2 years and considerably reduced through life cost. Specify a P4 Fastel FWS emergency lighting installation using Fastel Wireless or Fastel Link luminaires, signs or conversions and you are assured of products that will significantly improve safety in the workplace, public buildings, hotels, leisure centres and prestigious homes, whilst providing peace of mind of full compliance with all known applicable legislation and standards.